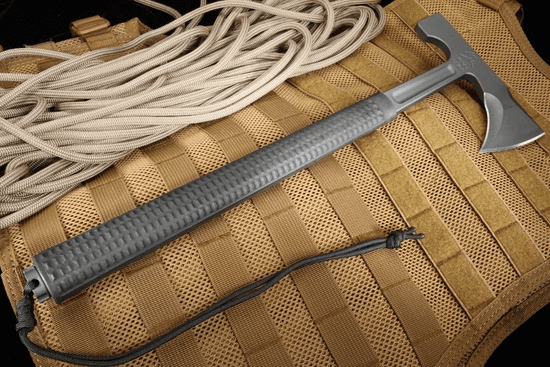 RMJ Tactical tomahawks have a reputation for being tough, reliable, and simple, yet more than capable of getting the job done in adverse conditions. What has built that reputation is hands-on tactical use by special forces units around the world for nearly the last 20 years. The Talon, Shrike, and now the little brother of the Shrike, the Loggerhead, are the best of what you can expect from modern day tactical tomahawks. The loggerhead is very similar to the Shrike, with the exception of a shorter, non-conductive handle and a hammer head where the penetrating spike was on its predecessor. Why the hammerhead? Well, because sometimes you need a hammer to get the job done! 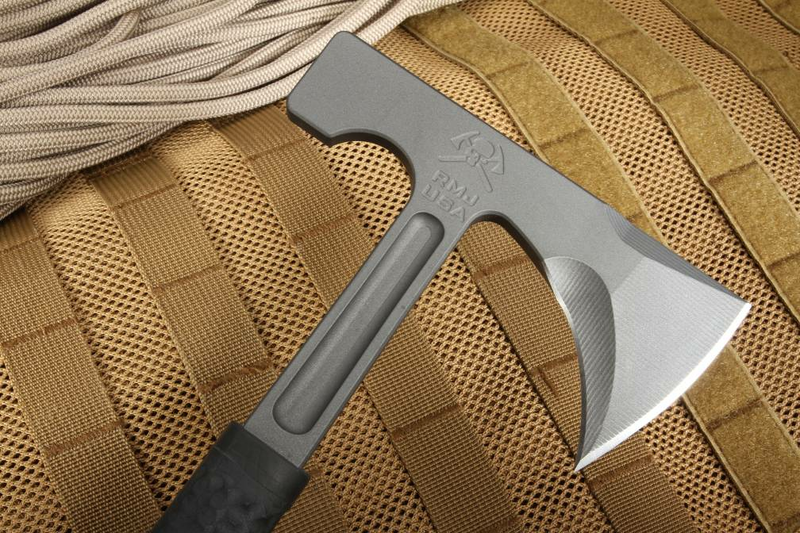 At 15.5" from knob to the head, the RMJ Loggerhead is a stouter tomahawk, weighing in at 24oz. The head of the Loggerhead is made from 3/8" 80CrV2 tool steel stock, which has been heat treated on the striking areas (hammer and beard) to a Rockwell hardness of 55. This improves the hardness of the cutting surface and the hammer while allowing the rest of the tool to be more forgiving when taking impacts. The forward edge of the axe has 2.75" of cutting surface while the hammer has 1.75" of surface area with 5.6" of steel separating the two ends. This provides for a heft and plenty of momentum when swung, as well as a good-sized amount of contact from hammer or blade. The steel is finished in tungsten cerakote, giving it corrosion and impact resistance, as well as a matte black tactical finish for glare reduction in low-light environments. 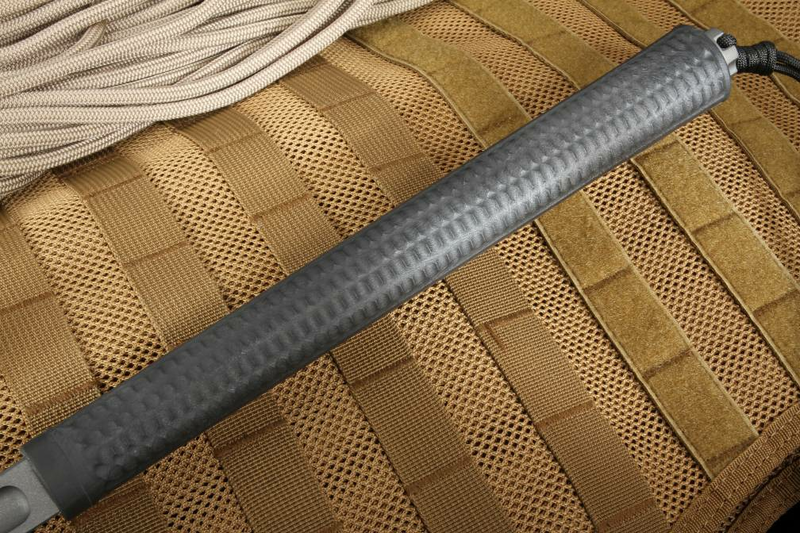 The handle is a 3D crafted G-10 polymer, which provides a sure grip and is very lightweight. It is available in a variety of colors, from Black to Hyena and others! The grip is also rubberized with high durometer non-conductive rubber to protect the user from up to 2,000 volts of electricity! (Independently tested). 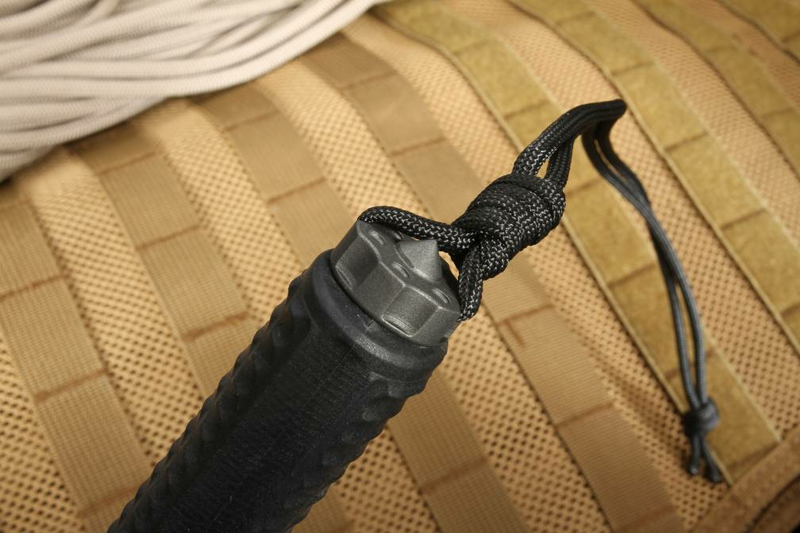 The Kydex sheath allows for easy carry and quick deployment. RMJ Tactical tomahawks are made in the USA. RMJ knives, blades, and tomahawks are protected by a lifetime guarantee against structural failure, not only for the life of the user but the life of the tomahawk! (Excluding normal wear and tear). 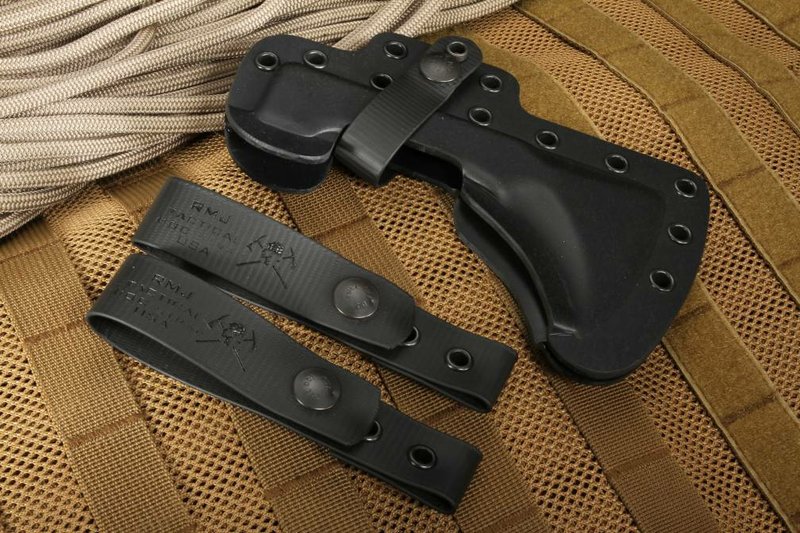 As an authorized dealer of RMJ Tactical, KnifeArt.com offers fast free shipping in the US and a satisfaction guarantee. If you don't like your purchase for any reason, send it back! There are no restocking fees.